How a 46-foot Maine lobster yacht completed a 7,700-mile transit from Southwest Harbor to Sitka. Pack ice surrounded Geraldine as Walt Jones stood at the helm peering into the fog to find a way through the seemingly impassable barrier. He goosed the throttle, and the 46-foot Wilbur lobster yacht moved forward into a narrow band of clear water, the ice closing in off the stern and blocking any prospect of retreat. 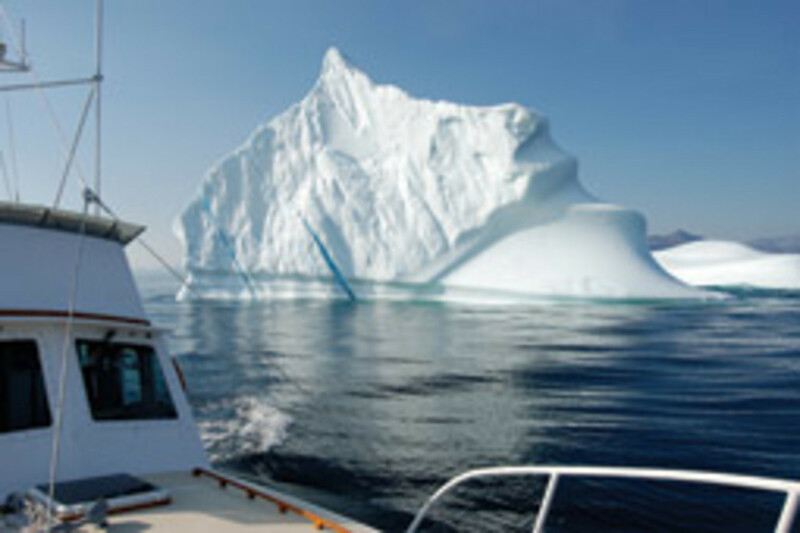 Pack ice can crush a fiberglass boat like Geraldine, or run under it to literally lift the hull from the water atop the ice. Jones, who had never experienced the Arctic, was getting his first real taste of the danger that is part of life in the frigid far north. If things went terribly wrong, he’d lose the boat, and people might die. 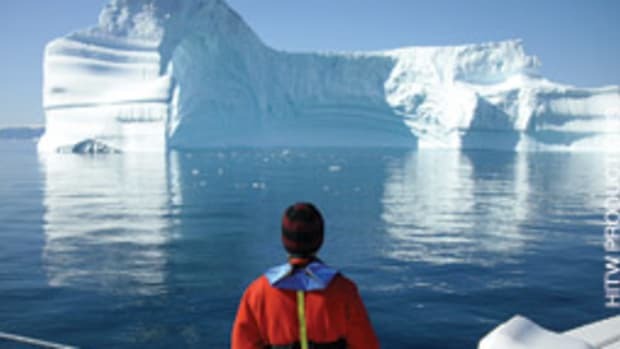 It was Aug. 7, 2008, and the boat nosed slowly toward Pond Inlet, on the northern reaches of Canada’s massive Baffin Island. Five hours out, they were at 72°46&apos; N, 75°01&apos; W. Northern Greenland lay off the starboard beam to the east, and the turn west into the Northwest Passage was nearby. 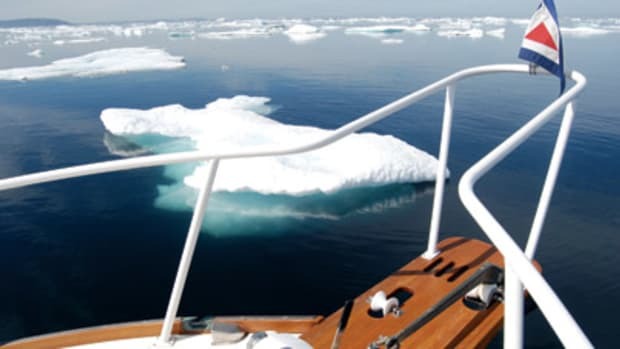 All reports indicated that 2008 was supposed to be a good ice year for making the 3,400-mile dash through the Northwest Passage, a series of five routes through the Canadian Archipelago linking the Atlantic and the Pacific. Yet Geraldine had encountered close to 70 percent pack ice coverage in Baffin Bay. And more ice awaited in the narrow channels to the west. It had been tough going just to reach the starting point of the Northwest Passage. 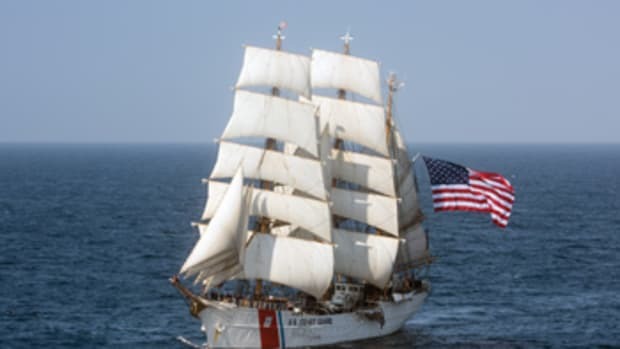 The transit across the top of the world would be challenging, but it was less than half of the voyage of roughly 7,700 nautical miles that would take Geraldine from Southwest Harbor, Maine, to Sitka, Alaska, the equal of 2-1/2 Atlantic crossings from New York City to Le Havre, France. Jones and his crew had thousands of miles still to go as they approached Pond Inlet. 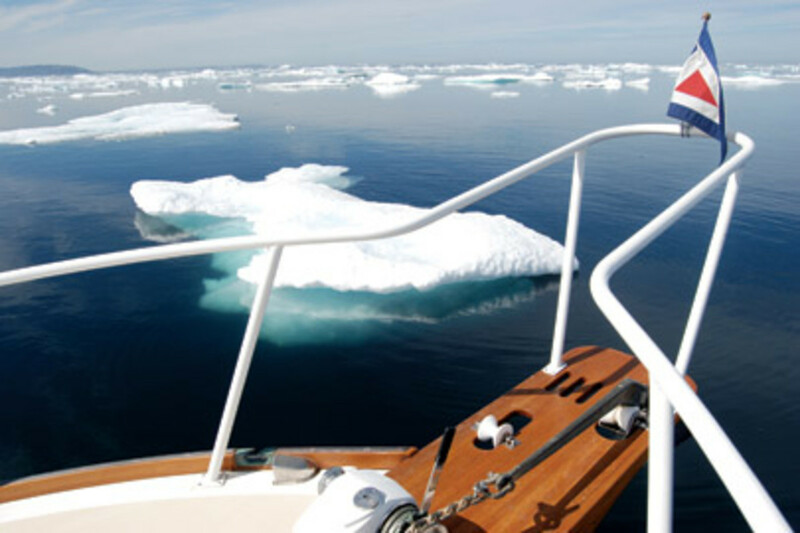 About 40 recreational boats less than 60 feet have transited the Northwest Passage in the last 30 years. The bulk of them have done it since 2004. The passage has thawed somewhat during recent summers, and daredevils now are trying to make it through on recreational boats in greater numbers. Some end up getting frozen into the ice for multiple seasons before they can get out of the Arctic. Jones, a manager for a non-profit organization, isn’t a daredevil. 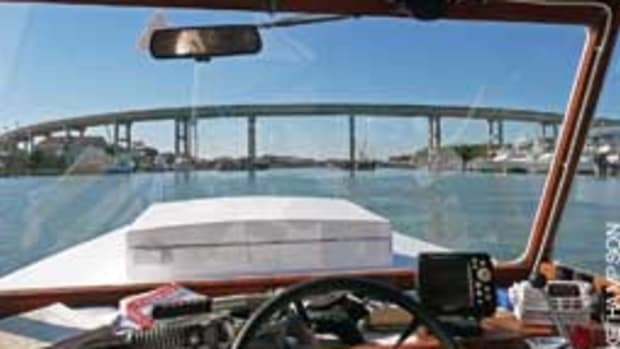 He says he never nursed a lifelong dream of “doing the passage.” He simply wanted to get his newly purchased and outfitted boat from Maine to Alaska, where he plans to do extensive cruising with his family. The voyage was a high-latitude adventure with a practical objective. 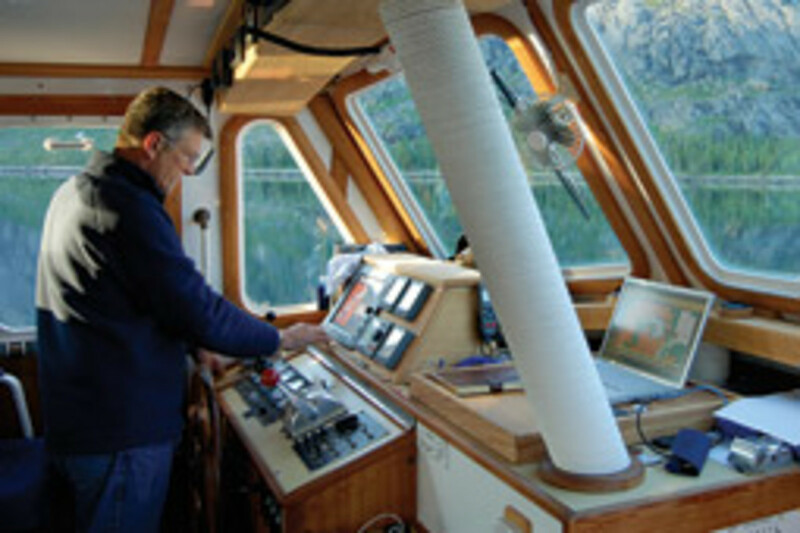 A boating enthusiast since age 12, Jones, 61, has owned a series of sailboats. He cruised the East, West, and Gulf coasts, gaining on-water experience that served him well during his transit of the Northwest Passage. He and Kip fell in love with cruising Alaskan waters after two memorable charters aboard a trawler and a fantail cruising yacht. They wanted to see more on their own powerboat, but they first had to find the right one. Jones, who lives in Los Gatos, Calif., near San Jose, initially considered buying a trawler, but then he and his wife saw a Maine lobster boat in San Francisco. They liked the design. “We love the lines of these boats. They have a reputation for seaworthiness and easy motion, and that was important to us,” Jones says. 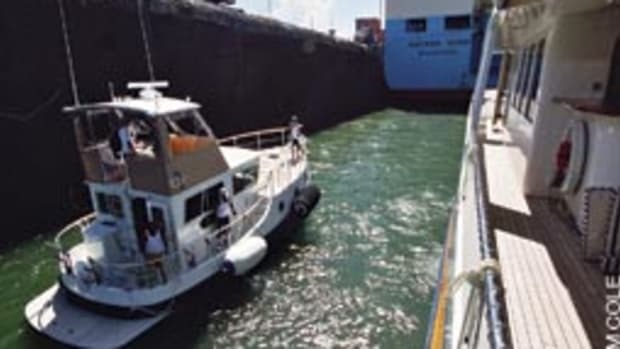 They found the 46-footer they eventually bought and renamed Geraldine in Maine, and commissioned Wilbur Yachts in Southwest Harbor, which had built the boat in 1985, to do the refit. It took 21 months, and during that time, Jones considered the options for getting to Alaska. “We evaluated all the possible ways to get [the boat] there, and one way was to go north. We love northern latitudes, and as we researched the possibility, the idea of doing the passage became exciting,” Jones says. That day in early August, six weeks after leaving Southwest Harbor, was the culmination of possibly too much excitement. Engine trouble, a fouled prop that required a crewmember to dive into the freezing water, a malfunctioning watermaker, a partially fried electrical system, nasty weather, and difficulty in getting spare parts drove home the point that transiting the Northwest Passage was nothing to take lightly. In low spirits, Jones and his crew considered turning back, but they kept going, hoping to make it through before winter. Turning west into Lancaster Sound marked a high point. Geraldine was in the Northwest Passage, reeling off the miles in the right direction. Pack ice was still a concern, but Jones carefully monitored reports from the Canadian Ice Service to advise him on conditions ahead. Cruising at an average speed of 7.5 knots, the crew motored long into the night under the midnight sun; at that point in the voyage, they had 22 hours of daylight and two hours of dusk. It never got completely dark. The stark beauty of the Arctic was stunning, Jones says. The trees disappeared. The land looked like nothing anyone aboard had ever seen firsthand, and it stood in marked contrast to the soaring cliffs and deep fjords of Baffin Island. “The scenery, the wildlife — it was all incredibly beautiful,” Jones says. There are few places to fuel up in the Northwest Passage. When they reached tiny outposts where fuel was available, Jones had to run the boat slowly up on the rocky shore, where a fuel truck waited. “Intentionally grounding your boat isn’t something you’re used to doing, especially in the swift currents up there,” he says. It was all part of an unforgettable experience, though — as was tying up to a dock only to have the water disappear when the tide went out. Scattered about were bergy bits and larger chunks of ice, all sitting high and dry. Geraldine passed within 300 miles of the magnetic North Pole; compasses and the autopilot were useless. The GPS system was blind to the boat’s orientation. Jones and his crew had to plot courses and hand-steer. Pushing hard to beat the approaching winter, Jones and his crew left Nome, Alaska, Sept. 4, for the 600-nautical-mile run offshore to Dutch Harbor, in the Aleutian Islands. 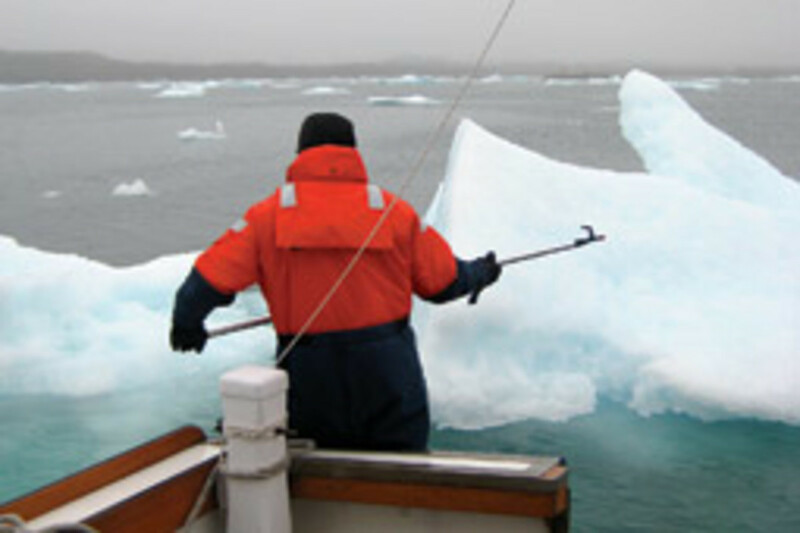 Almost immediately, they encountered rough conditions in the Bering Sea. A strong southerly wind kicked up 15-foot breakers right on the nose. The boat pounded and shook with every impact. The aft deck flooded repeatedly. For four days, Geraldine battled the stormy conditions, slowly motoring south. The crew was exhausted. And when they arrived in Dutch Harbor, they considered themselves lucky. Jones knew the Bering Sea was no place for a 46-foot Maine lobster boat, but he had to risk the crossing to get south. The Northwest Passage was challenging, he says, but getting to it and returning from it was even harder. After a brief rest at Dutch Harbor, Jones pushed on, stopping frequently at ports on the Gulf of Alaska as the boat headed east toward Sitka. The weather was cold, and the darkness of winter was closing in. Mountains soared skyward. Whales breached around the boat. Glaciers of shimmering blue and white reached the shore on some parts of the coast. On Sept. 27, after 94 days on passage, Jones guided Geraldine into Sitka, where the boat would spend the winter and be ready for Alaskan cruising the following summer.